Demand that is specific to a particular context-of-use. So you say you want to put your clients first. By saying this, I assume you have decided that product/service excellence is not sufficient for you to survive. Your accountability hierarchy does not define your enterprise. What matters is the way the enterprise spans complexity on behalf of your clients in order to create value for them…(distinguishing novel emergence from hierarchy). Hierarchy may be the way you maintain sovereignty over your enterprise, but you will need to know how your hierarchy relates to the ways in which your enterprise exercises its spans of complexity…(defining sovereignty over task systems and sentient organisation). You will also need to know this about the other members of the ecosystem directly or indirectly supplying your clients…(stratifying relations of novel emergence subject to supply-side sovereignty: r-type and c-type propositions). To understand the nature of your clients’ needs and what are the value deficits they are experiencing…(defining demand asymmetry: demand situations, effects ladders and P-type propositions). To think through what kinds of alignment are needed to address your clients’ situations one-by-one and how to sustain that alignment dynamically over time…(surrendering sovereignty through business platforms and K-type propositions). To lead your enterprise in a way that enables your people to identify not with what it does, but with what it can learn that will be valued by your clients…(on being edge-driven: outside is inside). For the competitive positioning of your enterprise not to be sufficient, in terms of its product/service excellence, you must be facing some kind of dynamic in the relationship that you must sustain with your client-customers. This means transitioning to a relational approach to competitive positioning (see value propositions at the edge). Whether or not being relational is in the interests of your enterprise is a question of the economics of one-sided versus multi-sided markets. When faced with multi-sided demands, the effect of using silo’d organisation, characteristic of positional competitive positioning, is that it results not only in the costs of alignment falling on the client-customer, but also in the costs to the sources of demand within the larger ecosystem being 30%-50% greater (see competing within ecosystems). Why? Because while the client-customer is getting a worse service (that they have to compensate for themselves as best they can), the supplying organisations get paid too much for a one-sided approach, the additional expenditures going to the suppliers at the expense of the client-customer. In the private sector this can be left at the door of ‘market failure’ i.e. the suppliers don’t want things to change because it will work against their interests. In the public sector, however, this means that the citizen pays twice – indirectly in taxes to pay for one-sided suppliers, and directly through having to pay too much for inadequate services and/or paying for the gap personally if they can afford to. The key issue here is this form of ‘market failure’ aka an inability to sustain a relational form of organisation. Hence the question: do you really want to put your customers first? What happens when an enterprise must respond to its client-customers one-by-one? The enterprise will face demand asymmetry and therefore will need to be able to make under-determined choices at its edges over the extent of any value deficit it seeks to address in creating shared value. The multi-sided nature of the demand will require that the enterprise must support multi-sided relations between multiple product/services and therefore a business platform that is itself multi-sided, these business platforms then requiring network-based architectures. This all means that we are dealing with supporting novel emergence of a third kind. What does all this mean for how we define the enterprise? Note the ‘big data’ matrix here, representing all possible traces of behavior, whether generated directly or indirectly, which support the K-type dynamic alignment processes, along with the platform (matrix 4-platform), through which multiple product/services are dynamically aligned to the customer situations in matrices 6 and 7. 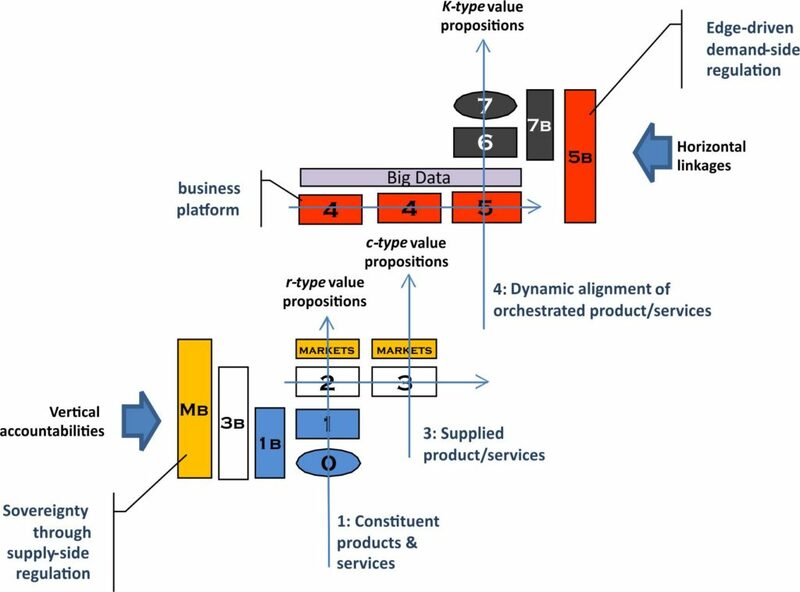 Whereas the effects ladders (matrix 6) define how effects are generated on the overall demand situations of client-customers (matrix 7B), Matrices 5 & 5B define the K-type propositions through which ‘big data’, the platform and the product/services are orchestrated and aligned to the customer situations. Delta Smart is the on-collar training device and activity tracker that works in tandem with the Garmin Canine app on your compatible smartphone. Your pup is more than just a pet, so get the tools you need for effective training and a more comprehensive look at your furry friend’s activity, even when you’ve been away. Our system lets you monitor and train with bark detection/limiting, behavior corrections, activity monitoring and more. In this case, Garmin is supplying a platform that is a combination of smartphone app and an on-collar training and tracking device. It is also providing the ‘big data’ traces of the dog’s behavior. The point here, however, is that the orchestration and synchronisation of these capabilities within the dog-owner’s context-of-use are left to the dog-owner. In other words, unlike with the hospital that is itself providing K-type propositions, in this case the platform is aimed at enabling the dog-owner to develop their own K-type propositions. 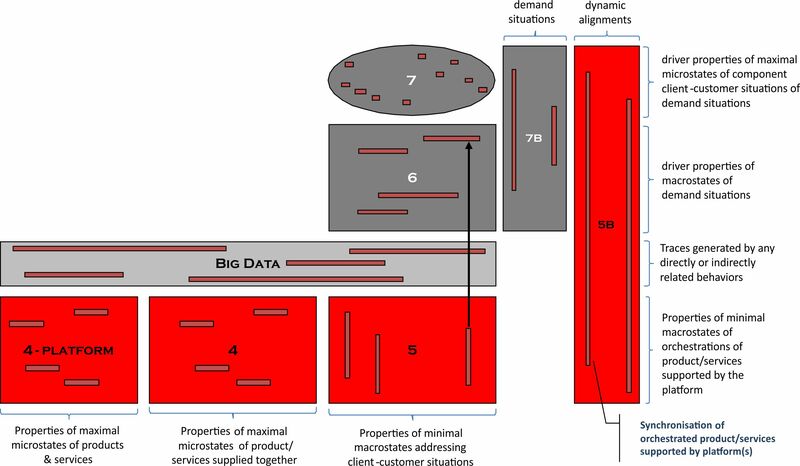 ‘Big data’ and the platform together with matrices 4-5-5B generate economies of alignment: the ability to create additional ways of organising the business relationship with a customer over time, not only reducing the average cost of alignment of business operations to the dynamics of each customer relationship, but also reducing the costs to the client-customer of the value created. Creating economies of alignment are critical to competing within ecosystems by creating indirect value. In the context of healthcare, there are not just the economies of alignment arising from shortening the length of the patient’s journey through the hospital’s care pathways. There are also economies of alignment arising for the patient such as reduced recovery times and less travel to-and-fro for appointments. the edge-driven demand-side (relational) approach does as much as possible for its client-customers without jeopardising the sustainability of the enterprise. Whether the supply-side or the demand-side are dominant depends, of course, on the competitive dynamics of the ecosystem within which this tension is experienced. In the case of the hospital, are the costs evaluated at the level of the hospital itself, or at the level of the through-the-life-costs of the patient’s condition. What makes it difficult to move towards being edge-driven is not just the surrender of sovereignty necessary to becoming edge-driven. It is also difficult because establishing demand-side accountability is inherently more complex. Nevertheless, all enterprises have to go through a P-K-c-r cycle, as described in value propositions at the edge. The issue facing an enterprise, therefore, is the tempo at which this cycle repeats itself, and how much time has to be spent in each part of the cycle. of the first kind: r-type value propositions, associated with the 1st asymmetry (the technology does not define the product) – see distinguishing novel emergence from levels of hierarchy. of the second kind: c-type value propositions, associated with the 2nd asymmetry (the organisation of the business does not define the solution for the customer) – see stratifying relations of novel emergence subject to supply-side sovereignty. of the third kind: K-type value propositions, associated with the 3rd asymmetry (the demand of the customer should not be equated with the customer’s experience) – edge-driven dynamic alignments to customer situations. of the fourth kind: P-type value propositions, also associated with the 3rd asymmetry (the customer’s experience should not be equated with all of the experience that the customer wants) – see demand asymmetry – defining demand situations and effects ladders. Of course not all behaviors leave a trace, not all traces are captured for later recall, and of all the traces that could be captured, not all actually are. Even if traces are captured, there is no reason to assume that they are used in any way for the purposes of managing. For example, looking at commissioning of health care, much data is collected about patients, but the ways of examining that data are not organised in such a way to make the patient’s experience over time accessible for the purposes of managing outcomes. See also managing over the whole governance cycle – ‘destination’ involves P-type and K-type propositions, ‘comparison’ and ‘custom’ are different kinds of c-type proposition, and ‘cost’ is r-type. What distinguishes a platform strategy? Richard Veryard asks does everyone (except Google) have a platform strategy? The consensus appears to be that it does not, because as Richard argues in Google as a Platform (not), while it ‘gets ecosystems’, its approach to it is ‘closed source’2, contrasting with the open source approaches of an Amazon or an Apple. The ability to go beyond normal business practice and to seize opportunity in widely adjacent markets – think Apple in music, smartphones and, soon, TV. This does not appear to be what Google is doing, with its continuing reliance on its advertising revenues, and with everything else it does being seen as a means of building traffic on which its revenues depend. secondly whether or not the platform is used primarily for capturing direct (one-sided) or indirect (multi-sided) value. ‘Closed source’ is contrasted with ‘open source’ in Architectures that integrate differentiated behaviors, in which the platform supports indirect value for the customer, but does so through providing its own portfolio of complementary products and services. Real options are used in Evaluating platform architectures within ecosystems: modeling the supplier’s relation to indirect value. To be effective, these valuations have to be defined using a structural model of the supplier’s ecosystem and its relation to demand. Direct value is value captured from the direct relationship with a customer, the direct value being a cost to the customer of the direct benefit they derive from the direct relationship. From the supplier’s perspective, this is referred to as a ‘one-sided’ relationship because there is only one relationship to consider. In Amazon’s case for example, I end up paying money to Amazon for the book. Richard’s use of ‘positional’ to describe Google’s strategy only works if we define their business model as extracting ‘rent’ from their proprietary search capability. And it is true that Google pursues the first two of the three asymmetries in the way its uses its technologies and market channels in delivering its services. But here I am arguing that their pursuit of the third asymmetry through the capture of indirect value makes their strategy ‘relational’ – Google is endlessly trying to find ways of being indirectly useful within the context of the customer’s working/searching situation. This brings us to the world of edge-driven collaboration and many of the challenges facing government in how it evaluates services for its citizens (for exampling investing in e-Government). Thus Social Flights is providing a business platform that can support a two-sided market: on the one side are travellers with particular routes in mind, and from the other side are the owners of private aircraft selling capacity on particular routes . What makes it two-sided is the different relationship that Social Flights has with each side. Customer situations – situations in which there is a need for a particular form of collaboration between customers and complementors. In this case, the need (for example) for members of a team to travel together to play an ‘away’ match. Customers – the end-users within a customer situation i.e. the team members. Complementors – the suppliers whose product/service offerings are needed within particular customer situations i.e. owners of private aircraft offering lower overall costs on the particular route. Platform – the means by which customers and complementors are enabled to come together to form a collaboration i.e. the capability of Social Flights to bring customers and complementors together. From the perspective of any one complementor, say an airline or a clinical specialty, the market is one-sided: they are there to provide flights or operations to the market. This one-sided view of demand defines demand as symmetric to their service offering of a direct benefit. 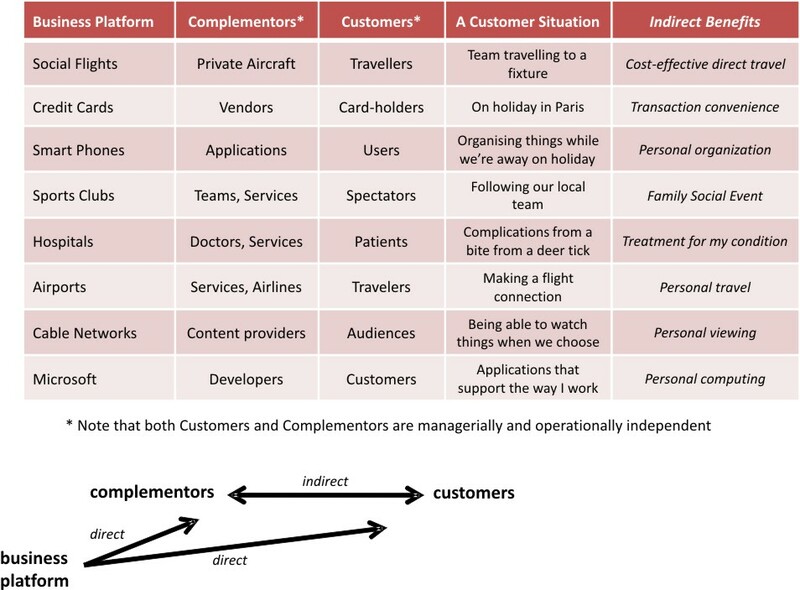 But if they define their market as multi-sided, they must take an asymmetric view of demand, identifying the customer situations giving rise to the collaborations that include a demand for their particular service offering – the types of travel situation creating demand for their routes, or the types of patient condition creating demand for their clinical services. And they must organise their propositions to extract indirect value from these (asymmetric) customer situations, not just from particular (one-sided) direct demands. Code-sharing airlines or hospitals are the result . 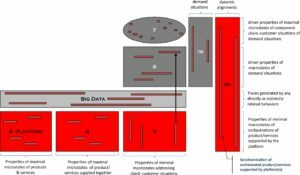 Thus what makes the demand asymmetric is the competitive need to consider the larger situation within which the particular demand arises, and to take into account the way the interactions within that larger context affect the particular demand. How does the business platform ‘extract value’? It has to be able to support the greater social complexity involved. And it has to be able to support it in a way that creates value for the customer by reducing the customer’s costs of alignment of the various complementors to their particular situation. The take-home? We have to be able to understand the relationship between the platform architecture and the variety of forms of indirect value it can support. See also Richard’s earlier blog on two-sided markets using the example of retailers. The platform approach thus enables the tension to be managed between rings and wedges (i.e. between the economies of scale & scope of particular services provided by complementors, and the economies of alignment involved in bringing them together as a collaboration responding to the customer situation as a whole). What is challenging in this, of course, is that it involves a change in the way the business defines its competitive identity – from a supply-side definition of itself (we fly these kinds of route or we perform these kinds of surgery) to a demand-side definition (we can organise your travel or we can manage the treatment of your condition). But this change in competitive identity also drives innovation and transforms industries. In terms of rcKP services at the edge, only the r-type proposition treats demand as one-sided, all the others becoming increasingly involved with the larger customer situation within which demand arises. This value for the customer is indirect value from the perspective of the platform. The need to establish economies of alignment is currently a major issue in public services, where the government ultimately pays for these indirect costs arising when citizens fall into the gaps between direct public services. This kind of analysis was used in a Swiss e-Government case. Differentiate and Integrate systems to help manage complexity. In the first case the drive is towards a single unified system supporting the enterprise, while with the second it is towards differentiated systems brought together under a central authority as a system-of-systems. He then introduced a third agenda in which the forms of integration could themselves be differentiated, enabling systems to be brought together in varieties of ways forming different systems-of-systems. This third agenda he associated with enterprises that were having to form collaborative alliances with other enterprises, working within business ecosystems  to meet multi-sided demands . My own presentation on supporting social complexity in collaborative enterprises addressed this third agenda. It described multi-sidedness and gave a number of case examples, including e-Government and Healthcare. It made the point that with this third agenda, the architecture of the enterprise was not longer the primary concern. Rather it was understanding the variety of ways in which the social complexity of collaborations created value for the customer, and therefore how, from the perspective of the supplier, platform architectures needed to be able to capture indirect value. A business ecosystem is made up of numbers of operationally and managerially independent suppliers and customers interacting with each other in support of many different kinds of demand (e.g. the suppliers of the products, applications and services clustering around customers’ uses of Apple’s iPhone platform). A one-sided demand is one for which supplier can define its product or service in a way that is independent of the context within which it is used by the customer (e.g. the demands met by a retail outlet). A multi-sided demand is one for which this is not possible, so that the supplier must take account of how the customer uses its product or service in combination with other products and services (e.g. the multiple interacting services involved in treating a complex medical condition). A platform architecture is the means by which East-West accountability can be delivered, providing a way of managing the tension between rings and wedges. Modern information systems operate at every level: from data held in a single purpose ﬁxed device, through common PCs at home or mobile computing with business systems of an SME, to databases, intra-acting locally and at national level, inter-acting between nation states and even then open to wider global systems outside of Europe. This interoperability requires global coherence which in synecdoche correlates with the interoperation of the EU itself. Semantic interoperability defined in this way cannot accommodate the pragmatics of demand that involve going beyond the perimeter of a single sovereign enterprise. The enterprise may be forced to deal with demand asymmetry. Let us say that an enterprise is an enterprise context, defined by the existence of a natural transformation between the functors representing its sub-contexts i.e. its functors commute at all levels. These sub-contexts may be further refined by defining sub-sub-contexts etc in terms of sub-functors. In these terms, the hierarchy of the enterprise can be expressed in terms of the ‘is-part-of’ relations between the enterprise context and these subordinate functors representing subordinate enterprise contexts. Let us now say that a customer situation (the experiencing of a need) is also defined as a natural transformation between the functors representing its sub-situations. These sub-situations may be further refined by defining sub-sub-situations etc in terms of sub-functors. In these terms, an effects ladder for the customer situation will be expressed in terms of the relations between the customer situation and its subordinate functors representing subordinate situations. For example, a hospital is an enterprise, with one of its sub-contexts providing a hip-replacement service. A patient’s condition would then be a customer situation, the need for a hip replacement being one of this condition’s sub-situations. Now consider that the patient’s condition demands a number of different treatments provided by different specialist organizations – physiotherapy, home nursing, orthoses, home help. This would be a demand higher up the patient’s effects ladder, addressing more of the need arising from their condition (and thereby reducing the patient’s value deficit). Let us say that a geometry-of-use is a functor composing some number of sub-functors within the hierarchies of some number of different enterprises. A stratification can be expressed in terms of the ‘is-used-by’ relations between the geometry-of-use and these sub-functors, representing how these sub-functors are composed. Which brings us to demand asymmetry. A demand arising from a customer situation is asymmetric for an enterprise if the functor of the geometry-of-use can not be made to commute at all levels with the functors of the enterprise i.e. there is no natural transformation between the functor for the customer situation and that of the enterprise as a whole. It is this demand asymmetry that forces us onto the ground of collaborative systems of systems and beyond. An independent review into the way the MOD buys equipment for Britain’s Armed Forces was published yesterday, Thursday 15 October 2009. [Report, MoD News Article, BBC News]. Key finding. That situation might sound familiar to a lot of managers, not just in the defence sector. The report makes some favourable comments about the Through Life Capability Management (TLCM) programme, but indicates a lack of hard financial data that would be required to make quantitative decisions. As regular readers of this blog may recall, there has been some discussion along these lines published in the RUSI Journal, including Agility and Innovation in Acquistion (Feb 2008) and The Meaning of Value-for-Money (Feb 2009). The explanation for the current crisis can be found in the essential multi-sidedness of the defence acquisition ecosystem. Traditional cost accounting approaches (such as activity-based costing) fail to address the complexity of this multi-sidedness, and researchers are urgently seeking alternative cost accounting methods appropriate for complex systems-of-systems. One of the key issues for Through Life Capability Management is that any errors or omissions in the long-term equipment programme must be repaired through what are known as Urgent Operational Requirements (UOR), which over the long haul can prove far more expensive and inflexible than the planned equipment. The report also praises the Smart Acquisition programme, and expresses regret that the disciplines of Smart Acquisition have been somewhat diluted by recent reorganization. Is this report only relevant to the defence sector, or can other sectors glean anything useful? My view is that the complexities of multi-sided markets and asymmetric demand can be found in many, perhaps most sectors. And the question of coordinating effectively between short-term and longer-term spending can be found in many domains, notably IT. I have little doubt that whatever management tools and techniques are developed by the MoD and its partners to address this problem will eventually trickle into civilian management. There has been a lot of buzz around two-sided and multi-sided markets lately. In his HBS March interview, Andrei Hagiu identifies Wal-Mart as an example of an organization that is transforming from a traditional merchant into a two-sided platform. Let’s look at the (asymmetric) structure of this transformation. The traditional retailer acts as a hub in the food supply chain, aggregating food supply from fields and factories, and distributing food to workshops and private kitchens. This is essentially a positional strategy: the retailer seeks to establish and maintain a strategic position within a value chain, as the bottleneck/hinge point between upstream and downstream. Within the positional strategy, the business drivers are understood in terms of the economics of scale and the economics of scope. But if we shift from a value-chain perspective to a service-oriented perspective (value-ladder), we can see that the retailer is providing a service (=delivering value) downwards as well as upwards – it is a food distribution platform for farmers and manufacturers as well as a food supply platform for consumers and catering companies. So instead of drawing the merchant in the middle, we can draw the merchant as a new kind of platform providing various kinds of market interaction. This takes us from a positional strategy to a relational strategy. No longer just focused on the economies of scale and scope, the relational strategy emphasizes how economies of governance are generated in relation to two kinds of demand context. The big question for a company such as Wal-Mart is how to balance the exploitation of each of these forms of asymmetric advantage. Masood Mortazavi uses Transaction Cost Economics to explain the difference between Managing to Contract vs. Managing to Relationship. In this post, I want to link this discussion to the key notions of Asymmetric Demand and Asymmetric Governance. “Managing to contract” implies a two-phase procurement process. In the first phase, all possible scenarios are identified, and a contract is negotiated that defines rights and obligations for each scenario. In the second phase, the emphasis is on compliance with the agreed rights and obligations. Unfortunately, it is hard to find good sources for this phrase on the Internet. Most of the hits lead to the antique humour of “managing to contract disease“. In contrast, “managing to relationship” implies a degree of trust between the parties, and an expectation that issues will be resolved to mutual advantage. Under certain simplifying conditions, there may be no observable difference between managing to contract and managing to relationship. The greatest observable difference can be found in highly complex procurement arrangements, involving either long-running contracts, or a series of separate contracts within a long-running relationship.Managing to relationship may still involve detailed contractual negotiations, but the emphasis is often upon establishing a collaborative governance process, rather than an attempt to anticipate all possible scenarios. Drawing on these axioms, we can see that the limitations of managing to contract are not just based on economic inefficiency (excessive transaction costs) but on ethical asymmetry – including asymmetric information and moral hazard. Managing to contract can produce destructive tactical behaviours such as chicken. Chicken: the first party to flinch is the loser. So when a project is going off track, each party tries to ignore the evidence that things are going wrong, in the hope that the other party will bail out first and bear all the costs. So there are some basic structural problems with traditional procurement arrangements, and managing to relationship won’t solve these problems alone.